Price Includes: Inside cabin (category D), first class (4 Star) lodging, breakfast and dinner daily, modern transportation, sightseeing as listed. 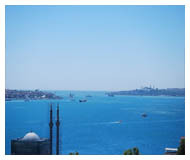 Not Included: Flight departures (low cost fares available nationwide), travel/cancellation insurance, optional port tours, gratuities, port taxes ($136.00), Turkey visa fee (U.S. $30.00 / Canada $60.00 USD) See information below. 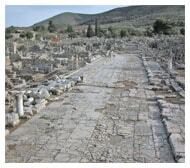 A stop will be made in Thyatira to view the ancient roadway and period columns en-route to Sardis. Sardis was berated by John for its facade of strength when in reality, it was weak (Rev. 3:1-6). Here coins were minted and the dyeing of wool originated. We'll visit the gymnasium and synagogue. Our next stop is nearby Philadelphia which was referred to as the "New Jerusalem" (Rev. 3:7-13) in the Book of Revelation. 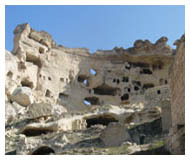 Not much is left of the city except for the ancient wall and the remains of a Byzantine basilica in the modern city of Alasehir. 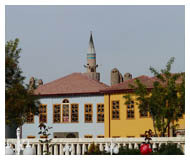 Our lodging this evening will be in a lovely spa hotel in Pamukkale. Hierapolis, meaning "Sacred City," was an ancient center for pagan cults until it was transformed into a Christian center in the first century. 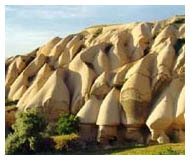 According to tradition, the Apostle Philip lived and was martyred in Hierapolis. It was likely the hot springs of Hierapolis in contrast to the cold mountain springs near Colossae that combined to bring application to the "luke warm" Laodiceans (Rev 3:14-22). 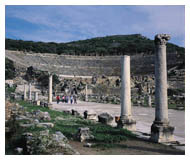 This connection between the cities lies behind Paul’s reference to Hierapolis and Laodicea in his epistle to the Colossians (Col 4:13). 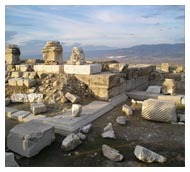 Laodicea contains many acres of ruins to visit including a stadium and remnants of a sophisticated water system. Nearby Colossae is well-known throughout Christian circles as the receiver of Paul's letter to the Colossians. Today, the town has fallen into obscurity and nothing remains. We spend the remainder of the day traveling through the Turkish countryside arriving in the port city of Kusadasi where we spend two nights. The day will not be complete without a visit to a local Turkish Rug cooperative. We travel to the nearby town of Selcuk for a visit to the Basilica of St. John, housing an immersion baptismal and believed to be resting place of John. From here we have an excellent overview of the Ephesus harbor and the Temple of Artemis, completed in its most famous phase around 550 BC and listed as one of the Seven Wonders of the Ancient World. Next, we travel a short distance down the hill to visit the Mosque of Jesus (Jesus is a respected prophet to Muslims). We spend the remainder of our day in Ephesus, the city of the Bible and one of the largest restorations still in progress with miles of ancient treasures. 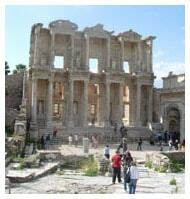 Ephesus was once a thriving port town of 250,000 people. Today you can still see the spectacular excavations of the major streets in this ancient city where we view the Library, Agora, Temple of Artemis, theatre, colorful mosaics, a panoramic view of the surrounding ancient port area including a wealth of church history and cultural insight. After breakfast we will visit Rhodes. You may chose an optional tour to Lindos where we will see the medieval walls built by the Knights of St. John and the Acropolis. 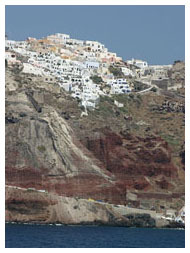 View St. Paul’s Bay where the apostle anchored on one of his voyages. 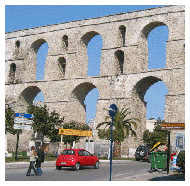 Continue with a walking tour of the city of Rhodes which will include the ancient ruins and the Palace of the Knights. Again we return to the ship for dinner. Departing Athens, we stop for a rest stop and photos at the Corinth Canal and then travel to the ancient city of Corinth, another treat for the New Testament scholar. 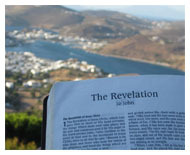 Corinth is the city that inspired many of Paul's most familiar letters. See the Archaeological Museum, the Market Place, the Bema, and the Temples. To enjoy a devotional in the midst of the ruins of the church of Corinth and see the pillars, steps, and public worship place where Paul preached will enhance your understanding and love of I & II Corinthians. The ruins of this important cultural center are fascinating as we walk along the stone path that the Apostle Paul walked. The engineering skill and intellect of these people are evident in the water systems that still flow from ancient to modern day. Our guide will be sure to show you the room dedicated to the medical care of that period. After the visit to ancient Corinth we travel to Mycenae where the remains of the ancient city date back to the Bronze Age to see the famous Lionesse Gate, the Tomb of Agamennon in the shape of a Beehive, and many other sites before continuing back to Athens.